As you might already know, we have two little girls, Jules and Emma, ages 5 and 2, who are the inspiration for pretty much everything we do here at My Little Jules boutique. I love dressing them up in coordinating sister outfits, however I have never been a fan of matchy-matchy looks. Luckily for me, most of the brands we carry offer cute coordinating looks that are so perfect for sisters. In this post, I would like to feature my personal 15 most favorite sister looks for fall you will find at My Little Jules boutique. It was love at first sight! These adorable Giggle Moon clothing outfits have won my heart since the first time I saw them. They look so wintery yet sweet and, with the bright and cheerful color scheme, can be easily worn all the way through the spring. This is probably my #1 favorite ensemble right now. I love Giggle Moon for its comfort and darling girly designs! These cute Paper Wings clothing sister sets are a close second to the two outfits featured above. Paper Wings is also one of our favorite brands in My Little Jules household. My girls love this designer kids clothing brand for the softness of its fabrics, comfy relaxed silhouettes and cute graphics. They wear their Paper Wings clothes till they can't wear it no more (usually it's been washed so many times that it becomes unwearable). And what can be cuter for those long rainy fall days then a sweet "Rain Rain Go Away" tee? These are such cute dresses for the colder fall and winter months! Made from a thicker knit fabric, they are warm and comfy. I love gray for Jules and purple for Emma. We love Lemon Loves Lime for play outfits because it is always so comfy. I wish I could actually squeeze Emma into size 18-24 months Baby by Persnickety Clothing, so that she could wear the outfit I am featuring with October Sky Hi Low Sweater. But I think I will have to resort to option number 2. Either way, the outfits are adorable and I can hardly wait for cooler temps so that my girls can wear these cute sister sets by Persnickety Clothing! If your girls love tea parties and everything girly and sweet, then they will love these cute outfits from Haute Baby Hannah Grace collection! The skirt set features cute teacup and spoon applique. For the smallest fashionistas, you can grab Haute Baby skirted teacup onsie. For toddlers, we have a cute coordinating swing set. Check them out! If you are not into 'vintagy' clothing with lots of lace and ruffles, then you might like these sweet outfits by Kate Mack clothing. Kate Mack tends to run about 1 size small, so I size up for my girls. We always get at least one Kate Mack outfit per season and, as most brands we carry at My Little Jules, Kate Mack clothing is super soft and comfortable for my girls to wear. These garments are also so easy to care for! You can just through them into the washing machine. I dry our outfits in the dryer, but laying them flat to dry is more preferable. This season, my two favorite outfits are these coordinating sets that feature the same heart leggings and vertical ruffles. These two little outfits by Mustard Pie Clothing are just the cutest! Designed as holiday pieces, I think they will work just as well as everyday outfits. I will probably grab a pair of tango leggings (shown with the Mia dress on the left) for the baby outfit that Emma will wear. Knowing that Mustard Pie runs big, I think size 24 months will work for Emma. Neon by Sara Sara is out newest brand here at My Little Jules. We picked it up because we knew our customers would love fun and funky designs, comfy knit fabrics and great price points (most sets are under $50). And we were not mistaking!. The only bad thing about this designer girls clothing brand is that it only comes up to a size 6x. So, before Jules is too big to wear Neon by Sara Sara, I must grab these two outfit for my girls. The one of the left - "Smart Cookie" - is for Jules because it suits her so well. This girl is going through her "toddler teens" and has an answer for everything. And the "Puppy Love" set is for Emma because she is so sweet and cuddly! These two dresses by Jak and Peppar are on my wish list because I didn't get a chance to grab them before they sold out and ended up with a few Jak & Peppar tops instead. I'm not complaining, though, because the tops are really nice as well. But if there were more of these tunics available, I think they would make really cute sister outfits for my girls! Everyone loves this beautiful Persnickety Clothing Lexi dress and I am no exception. I am planning to put the dress on Emma because she still doesn't mind having a sash tied in the back. And Jules will wear coordinating top and skirt set featuring ruffle sleeve tee in green and Lily skirt. These are a must-have for us. It doesn't get cold enough to wear really warm winter jackets, so Mack & Co. fleece coats last us through the winter and early spring. If you are in the colder part of the country, then consider these puffy coats that are meant for winter temps. The big girl version of the black polka dot coat comes with a detachable hood not shown in the picture. Tutu Du Monde is one of our customers' favorite brands for pictures and special occasions. If I were planning a holiday or winter wonderland photo shoot, I would choose these coordinating outfits for my girls. These Peaches and Cream Clothing outfits are great for Thanksgiving and pumpkin patch photos. Emma is too big for the coverall, but I still think it is so sweet! Cute outfits for sisters who love puppies, both of these Kate Mack dresses come with coordinating leggings. The pink color is actually a little brighter in person. And, in case you can't tell by the picture, the puppy on the toddler set is wearing floral rain boots. I love these tattoo-inspired outfits by Paper Wings clothing! They have been a huge hit this season, especially the big girl version. Last, but not least, my personal favorite body style from Mustard Pie, these cute Josephine dresses come in two coordinating colorways - perfect for stylish sisters! Don't forget that all orders of $79+ ship for free in the US and Canada. 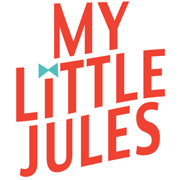 Plus, you get 5% back on most orders you place at My Little Jules boutique.